Right Handed or Left Handed 1 Hybrid Golf Club, Loft – 18 degree, Lie – 57 degree; Length – 40.5 inches with a graphite shaft. 40 inches with a steel shaft. 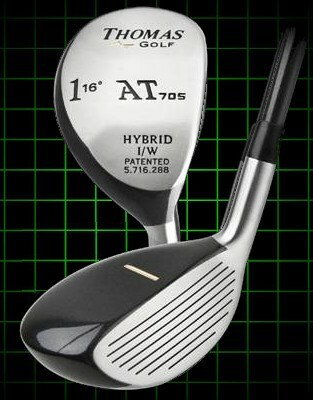 The AT 705 1 Hybrid Golf Club is a direct replacement for our standard 1 iron and our 4 fairway wood. Works will: for long second shots off the short grass or lite rough. More sole size then a number 1 iron for a better ball strike.